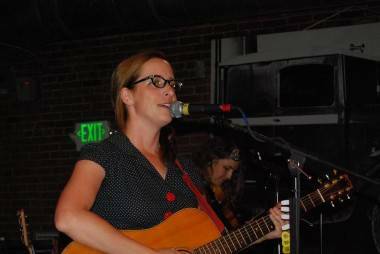 The room was full of red light and a close-knit crowd for Laura Veirs Thursday night at Tractor Tavern in Seattle. Coming off touring in the U.S. and Europe, Veirs is playing a short tour still heavy with songs from her seventh album, July Flame. Currently living in Portland, OR with producer Tucker Martine and their new son, Tennessee, the singer still writes songs about her life and environment. Songs like “Sun Is King”, with its lazy slide guitar, rang true in the muggy August heat and humidity . 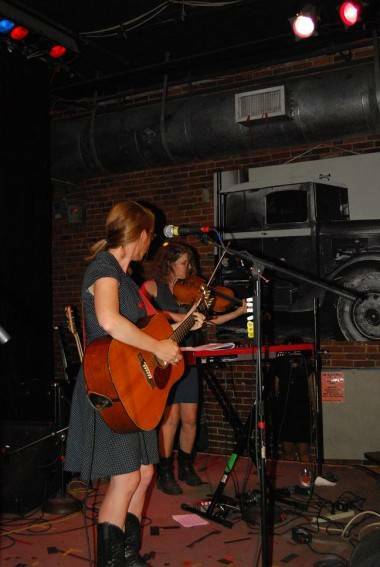 The bar was packed and the floor was empty when the show started with Cataldo, a four-piece indie-rock outfit fronted by Veirs’ former bandmate, Eric Anderson. They had a complex sound that was a delicate mix of syncopated beats and guitar solos behind Anderson’s crooning vocals. 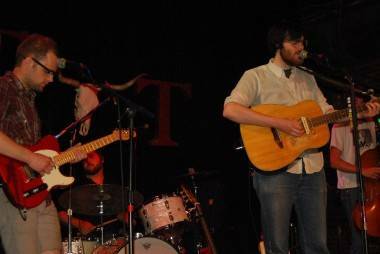 The crowd enjoyed Cataldo’s short set of rock songs, but was waiting for Veirs. Charming in a blue dress with big red buttons, the headliner began chatting right away about the music, joking that the show would be part of a spoken-word tour. The set was a mixture of songs from Flame and a diverse selection of tracks from the rest of her career. 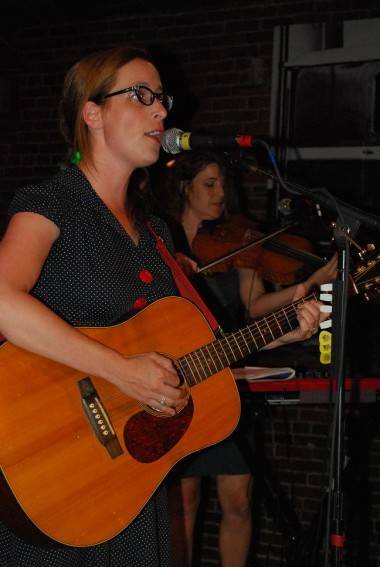 Backed up by Tim Young on guitar and Alex Guy on violin and keys, the small band played a cover by Mississippi John Hurt and the classic lullaby “Pretty Little Horses”, on which Veirs skillfully played the banjo. Eric Anderson was invited back onstage to play bass on “Carol Kaye”, a tribute to the ’40s bassist from Everett, WA. Songs like this and a beautiful track named “Chimney Sweeping Man”, about Veirs’ aunt and uncle, made the concert something memorable and sweet. The real apex of the show was “I Can See Your Tracks”, the lead song from Flame. The chorus is a race away from the progression of the song with a harmonic vocal rise and rhythmic change. It represents some of the bright transitions that Veirs can employ in a darker tune, achieving a delicious affect. Elliott Smith was capable of the same thing; all moody/melodic singers seem to end up in Portland. Laura Veirs & The Hall Of Flames played a set-list dense with atmosphere, inspiring choruses, and melancholy. The last song was “Through December”, a slow and haunting number that ended the concert on a note of pure sadness, a very unexpected encore. 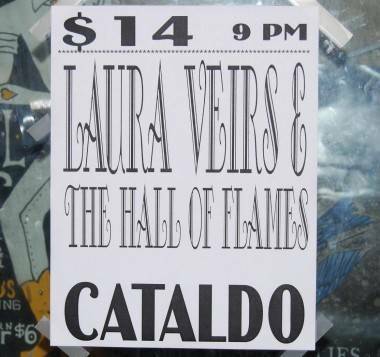 This entry was posted in Features, the latest and tagged concerts, Laura Veirs, reviews, Seattle. Bookmark the permalink.